You will also need 30 lollipop sticks and waxed paper. This makes 30 pops. Remove outer wrapping from Oreo package. Leave the Oreos in the tray they come in and place in the microwave for 30 seconds. Insert sticks into the icing of each Oreo. Heating the Oreos will make the icing softer so that the sticks will easily push into the Oreos. The hot candy makes dipping tricky, as the Oreos will slide off the sticks. I used a spoon to ladle the melted candy over the Oreos. Once covered, place the Oreos on wax paper to dry. You can change the color of the candy melts using food coloring. After drying for a few minutes, carefully place Oreos in the fridge to harden. 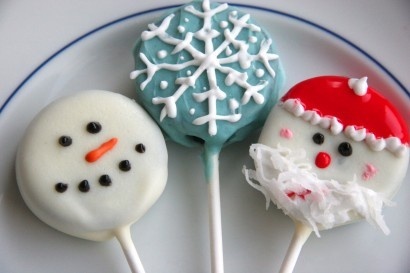 Make icing for decorating by beating powdered sugar, egg whites and cream of tartar until thick (about 3 minutes). Use some water to thin out. Place icing in sandwich bags and cut off the corner for decorating. Use your food coloring to create different colors for decorating. I used orange to make a carrot for Snowman’s nose, red for Santa’s hat, coconut for Santa’s beard, and white for snowflakes. After decorating, place in the fridge to harden before wrapping in cellophane treat bags.